Yesterday at 11:00 am Moscow time the Blue Stream gas pipeline supplied its 100th billion cubic meter of Russian natural gas to Turkey. In 2013 gas supplies via Blue Stream had stood at 13.7 billion cubic meters of gas accounting for over a half of the total gas volume (26.7 billion cubic meters) exported by Gazprom to Turkey in 2013. Alexey Miller, Chairman of the Gazprom Management Committee stated that for over 11 years Blue Stream has been an illustrative example of the efficiency and reliability of direct Russian gas supplies to European consumers. The project is the first offshore thoroughfare of such scale globally; it represents a great engineering achievement. Blue Stream made it possible to gain a unique experience in constructing and operating offshore gas pipelines, which can be put into practice as part of the Nord Stream and South Stream projects as well as the Dzhubga – Lazarevskoye – Sochi gas pipeline. Mostly due to Blue Stream, Russia became the undisputed world’s leader in terms of constructing cutting-edge gas transmission systems offshore and onshore. The 1,213-kilometer Blue Stream gas pipeline with the annual capacity of 16 billion cubic meters of gas was commissioned in December 2002 in order to directly supply gas to Turkey across the Black Sea. Blue Stream supplements the existing gas transmission corridor running from Russia to Turkey via Ukraine, Moldavia, Romania and Bulgaria. It gives an additional impetus to the Turkish gas market development. Blue Stream is a unique gas transmission facility. It is currently the deepest gas pipeline for Russian natural gas export. The pipeline lies at a depth of up to 2,150 meters on the seabed in an aggressive hydrogen sulfide environment of the Black Sea. The gas pipeline is made of high-grade corrosion-resistant steel pipes with internal and external polymer coatings, intellectual cut-ins at the mountainous and offshore sections. Moreover, for the first time in Russia extensive tunnels with the total length of 3,260 meters were built in the mountainous area for the onshore section of the gas pipeline. In 2005 the Blue Stream offshore section was supplemented by an advanced and unique technical facility – the Beregovaya compressor station erected through the use of cutting-edge technologies, with a high level of production process automation. The capacity of the compressor station equipped with six gas compressor units and three turbine generator sets exceeds 170 MW and enables to create a discharge pressure of up to 250 Ata. The Beregovaya compressor station is operated by Gazprom Transgaz Krasnodar. Turkey is Gazprom’s second largest sales market in Europe behind Germany. 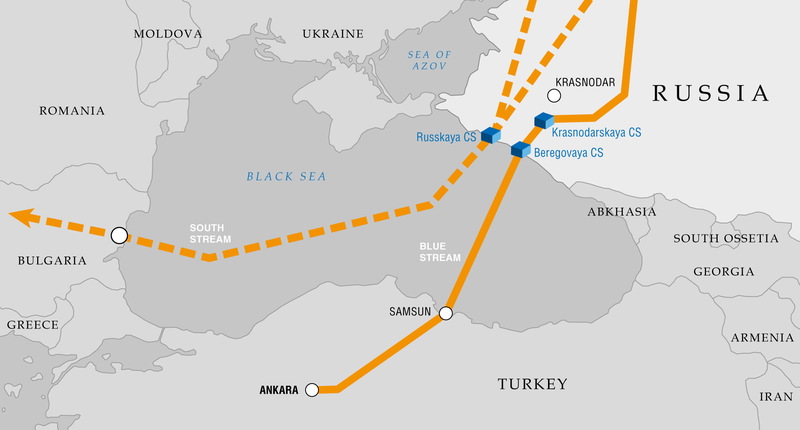 Russian gas is exported to Turkey via Blue Stream under a contract between Gazprom and Turkish Botas, according to which 365 billion cubic meters of gas will be supplied to the country during 25 years. By now, Blue Stream is fully loaded and conveys 48.1 million cubic meters of gas every day.